“World War II Ends: Dahlgren Tests Validate New Atomic Capability” is the theme of a community forum sponsored by the Dahlgren Heritage Foundation on August 11. Hosted by the University of Mary Washington’s Dahlgren Campus, Center for Education and Research, in King George, the community forum will be open to the public and offered at no charge. The event will begin at 4:30 p.m. with an informal reception and the program will begin at 5 p.m. 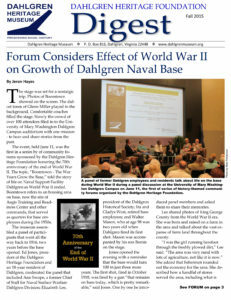 The Dahlgren Heritage Foundation is targeting 2015 as a year-long opportunity to observe the 70th anniversary of the end of World War II through the lens of the innovations and technology developed and tested by the U.S. Navy at Dahlgren, Va. that helped determine the outcome of that war and continue to be critical to the tactical and strategic capabilities to U.S. armed services today and into the future. The centerpiece of this year-long commemoration is a series of quarterly community forums. Vice Adm. William Hilarides, commander for Naval Sea Systems Command (NAVSEA) in Washington, D.C., is the featured guest speaker for the August 11 forum. Hilarides oversees a global workforce of more than 56,000 military and civilian personnel responsible for the development, delivery and maintenance of the Navy’s ships, submarines and systems. A 1981 graduate of the U.S. Naval Academy, Hilarides has served at sea on U.S. attack submarines and ballistic-missile submarines in deployments to the North Atlantic, Mediterranean, Arctic and Western Pacific. The forum will also feature a guest panel discussion that will include Dr. James Colvard, a former technical director for the Naval Surface Warfare Center at Dahlgren and former special assistant to the Secretary of the Navy, and Chris Kolakowski, director of The MacArthur Memorial in Norfolk, Va. The panel will be moderated by Ed Jones, president of the Dahlgren Heritage Foundation. While there is no charge to attend, registration is strongly encouraged and may be completed on line at www.eventbrite.com (search for Dahlgren Community Forum) or from the Dahlgren Heritage Museum’s Facebook site https://www.facebook.com/pages/Dahlgren-Heritage-Museum/218635358172762. UMW’s Dahlgren Campus is located at 4224 University Dr., King George, Va. From Fredericksburg, travel east on Route 3/Kings Highway for 15.3 miles. Turn left onto Rt. 206 east (Dahlgren Rd.). Follow Rt. 206 east for 9.3 miles and turn left onto U.S. 301 north (James Madison Parkway). Travel 2 miles, then turn left onto University Drive. As you pass Walmart, the road will bear left to the Dahlgren Campus.